Big, complex puzzles get all the attention, but doesn't the other end of the spectrum deserve a little love? Take the smallest jigsaw puzzle in the world, for example. It's not that complicated to put together, but only if you've got a magnifying glass and one hell of a fine touch. 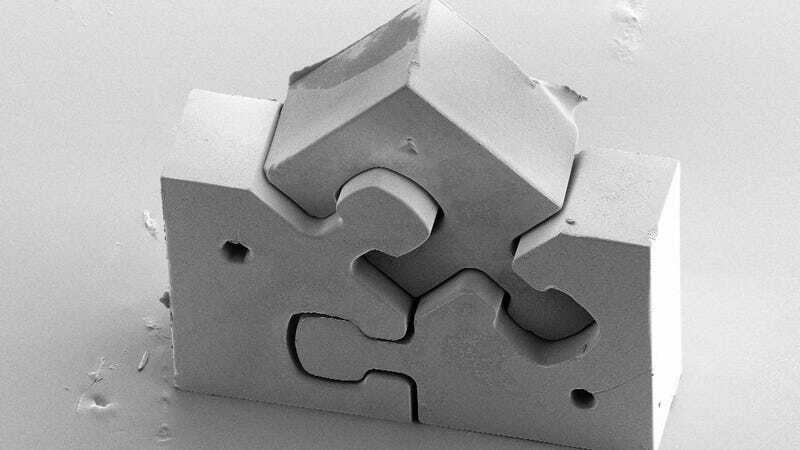 Created by researchers at the Karlsruhe Institute of Technology, the tiny puzzle has just three injection-molded pieces, each less than one millimeter in size thanks to a new molding process called LIGA2.X. Normally, when things this small are molded, they have to be attached to a substrate and then painstakingly removed, which is expensive and annoying. LIGA2.X lets them just pop out of the mold, no problem.